I won’t beat a dead horse here; I’ve already railed against the lack of enticing eats at City Creek Center in City Weekly’s Food & Drink blog. And, sorry, but I have zero interest in reviewing the 300-plus menu items available in the snazzy new Cheesecake Factory. However, if you’re shopping at City Creek and would like to support one of the very few local businesses there, I suggest stopping by the food court. True, the court is stacked with the predictable national franchises: Subway, Sbarro, McDonald’s, Chick-fil-A and the like. However, three unique, independent, local eateries are located there, as well, two of which—Bocata and Taste of Red Iguana—have been operating since the food court opened a couple years ago. Why anyone would choose McDonald’s fare over Mykonos, Bocata or Taste of Red Iguana is beyond me. I guess there are people who will always gravitate toward the familiar. A Cuban sandwich, souvlaki platter or enchilada with mole is probably a little frightening to folks who live for Big Macs. But if you’re willing to take a small culinary risk, you’ll be greatly rewarded at the aforementioned trio of independent eateries. I wish there were a Bocata (801-355-3538, BocataSandwich.com) in every U.S. mall. It’s a brilliant concept: made-from-scratch sandwiches utilizing pizza-style bread dough baked in brick ovens. Bocata is the creation of the guys from Settebello Pizzeria Napoletana, and they know a thing or two about dough. As with Settebello pizzas, at Bocata they use only first-rate Caputo 00 flour, imported from Italy, for their sandwiches. It’s formed into individual balls, tossed, given 24 hours to rise and fired in Bocata’s brick oven. The result is a crisp crust and chewy center. So, a Bocata sandwich begins with great bread, but it doesn’t end there. Most of the sandwich fillings are made from scratch and include ingredients such as fresh, oven-roasted Roma tomatoes; slow-roasted rosemary & garlic leg of lamb; and housemade meatballs using ground pork, beef, fresh breadcrumbs and Pecorino Romano cheese. The “drunken chicken” marinates in Red Rock Brewing Co. Hefeweizen brine (don’t tell the church! ), and the pork for Bocata’s Cuban pork sandwich ($7.49) is first rubbed with cumin and orange zest before a long, slow roast with sherry vinegar and citrus. Fresh turkey is oven-roasted for the delicious turkey and Havarti sandwich ($7.49), which comes with roasted red bell peppers and aioli. Still, my go-to Bocata fave is the porchetta sandwich ($7.49), which is fennel-rubbed, slow-roasted Italian pork with tangy, roasted red bell peppers and a green garlic sauce. The sides at Bocata aren’t merely an afterthought, either. You’ll find interesting options like a pear salad ($5.99); Tuscan white-bean soup ($3.95); Israeli couscous with red onion, dried cranberries and pistachios ($4.99); and roasted-beet salad ($5.99), for example. 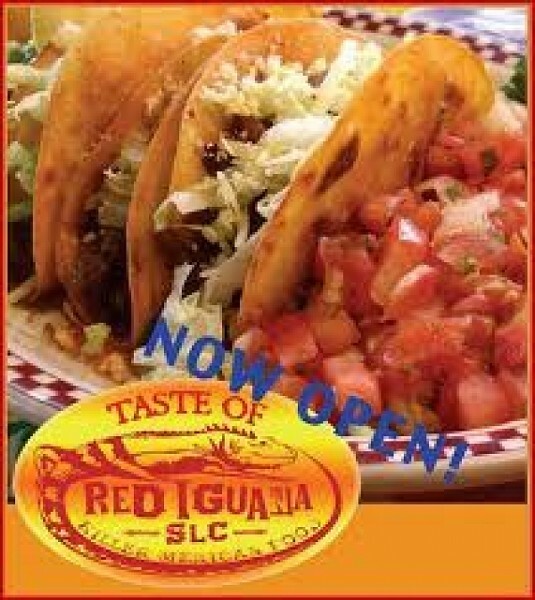 Taste of Red Iguana (801-214-6350, TasteOfRedIguana.com) at City Creek doesn’t have quite the visual appeal of its big brothers—the original Red Iguana and Red Iguana 2—nor the booze. But it does have the same bright and robust flavors. Burritos and fajitas come with chips and salsa at Taste of Red Iguana, while tacos and enchiladas also include rice and beans. That’s a pretty good deal, since most menu items are priced in the $4.50 to $8 range. I’m always torn: Do I order the burrito de chile Colorado or the burrito de chile verde? It’s red vs. green. Well, at a mere $4.59, why not choose both? The chile verde burrito is a flour tortilla stuffed with Red Iguana’s luscious pork chile verde and refried beans, then smothered with more of that superb chile verde. As for the chile Colorado burrito, it’s made with top sirloin beef and refried beans, topped with a rich, red chile Colorado sauce with hints of cinnamon and cumin. For tacos, it’s hard to beat the delicious “Kate’s famous fish tacos” ($8.99, two per order). Cumin-crusted halibut is served on soft corn tortillas with traditional accompaniments: shredded cabbage “slaw” (with cilantro, lime and honey), queso cojito, pico de gallo and cucumber salsa. Kids, of course, love the Mexican version of a grilled cheese sandwich: cheese quesadillas ($2.99) made with melted Monterey Jack cheese. And Taste of Red Iguana also runs daily specials, including enchiladas with mango mole on Thursdays and homemade pork tamales on Saturdays, plus breakfast items like breakfast burritos, and my favorite—the machaca burrito—served weekdays. Service can drag a bit at Mykonos (801-532-4480). During one visit, there was just a single cashier taking orders and one guy cooking. But it can be worth the wait, especially if you order the scrumptious grilled loukaniko sausage ($7.99). Mykonos’ pork sausages are made from scratch, and are very aromatic—scented with fennel, a smidgeon of orange zest and, I think, allspice—served with warm pita bread. The gyros ($7.99) and pork souvlaki ($6.99) are also very good, as is the lemon rice, which, thankfully, is seasoned with just a hint of lemon. Skip the falafel sandwich ($5.79), though; the falafel nuggets are too dry and topped with white yogurt-based sauce, not the tahini as advertised on the menu. If you don’t do meat (or even if you do), the dolmades are delicious: grape leaves stuffed with seasoned rice, no ground meat. The hummus ($3.99), too, is very tasty, and there are even seafood options: kalamarakia (fried calamari) with cocktail sauce ($4.49), and grilled shrimp with Greek seasonings ($7.99). Hopefully, now that City Creek Center is open and thriving, it will attract more local, independent entrepreneurs. I sure wouldn’t mind seeing a MacCool’s outpost there, for instance, or perhaps a Takashi To Go. For now, there’s a trio of local eateries well worth your while and your support.